The B-25 Mitchell was an American double-engine medium bomber that was produced by North American Aviation. It first gained fame during the Doolittle Raid on the 18th of April 1942. At this time, there were 16 B-25Bs that attacked mainland Japan. The attack, which occurred four months after the Pearl Harbor bombing, was led by Lieutenant Colonel Jimmy Doolittle. Aside from making Japanese targets, the aircraft was also used against German targets which had devastating effect. The B-25J Mitchell was inspired by American general Billy Mitchell, one of the most famous pilots that had helped shape American airpower history. He is known as the Father of the US Air Force. Throughout its flying career, the B-25 had gone through several modifications with series ranging from the B-25A to B25J. Each type had variations that increased its firepower. In the postwar years, the B-25s assumed roles given by the Air National Guard. Some had been assigned as fighter interceptor squadrons to support the F-94 and F-98 fighters. A few were used as personnel transports and weather reconnaissance. 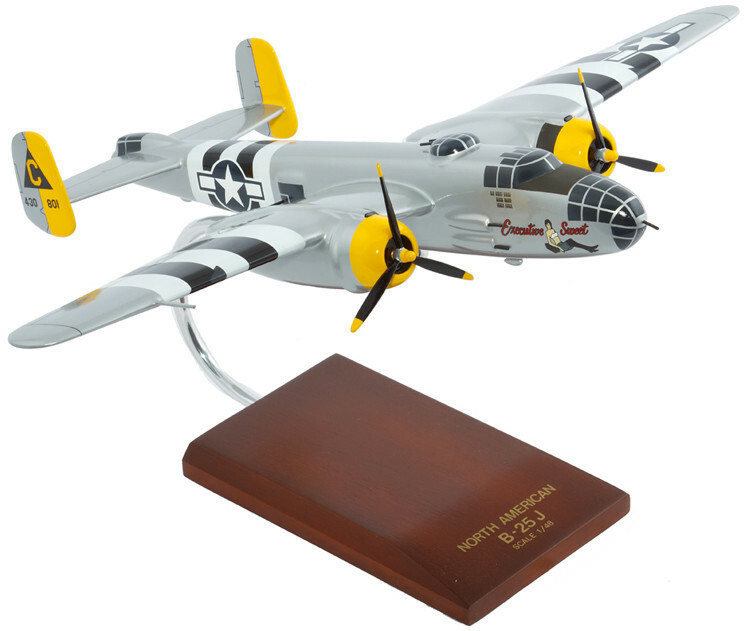 This wood plane model is designed to bring out the exact features of the original aircraft. It makes a great display and a thoughtful gift.